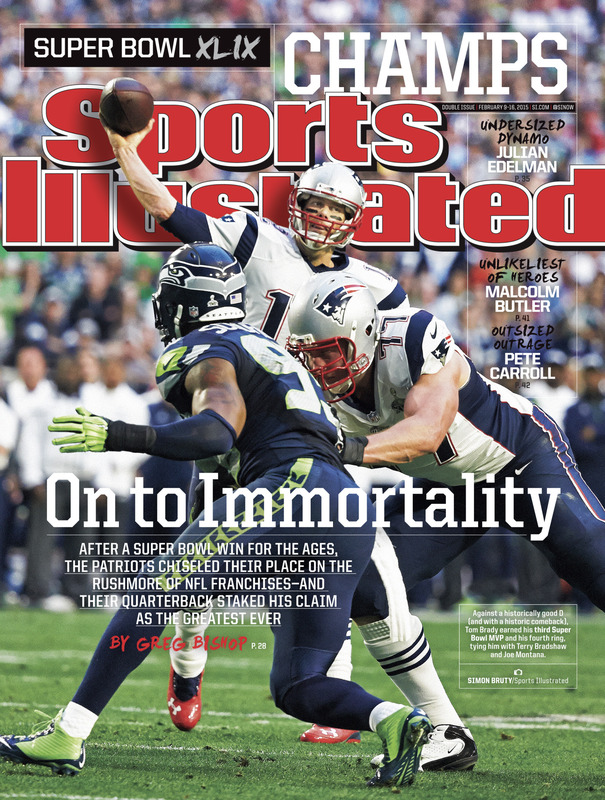 NEW YORK, NY (February 4, 2015) ­– This week’s Sports Illustrated features Super Bowl Champions: The New England Patriots and QB Tom Brady with a recap by Greg Bishop. With the big game in the rearview, SI offers a look at the needs and wants of all 32 teams, plus a list of the 40 best free agents available in an NFL Off-Season Preview. Pete Thamel analyzes how Western Michigan’s coach P.J. Fleck excels in the cutthroat game of recruiting. Watch out, Billy Goat: Joe Maddon is ready to change things up. Tom Verducci profiles the new face of the Chicago Cubs. Also in this issue, NASCAR’s Kyle Larson just might provide the fresh air that the all-American sport needs, while Alan Shipnuck dives into the brash and controversial life of professional golfer Patrick Reed. Luke Winn analyzes John Calipari’s efficient and top-ranked defense at Kentucky and Ben Reiter examines New York Rangers’ Rick Nash and his rediscovered puck luck. Shipnuck also introduces us to Toronto Raptors’ GM Masai Uriri who leads with perseverance, integrity and generosity thanks to the influence of his hero, Nelson Mandela, and SI presents Athletes to Watch in 2015, from tennis and soccer to swimming and track, they’re poised to grab our attention. The lead-up to the Patriots-Seahawks defied logic (and maybe science). The game itself reversed the laws of probability (and maybe play-calling). But after an instant-classic win, this can’t be questioned: the place Tom Brady and the Pats hold in history. A game full of suspense, fantastic performances and questionable calls stands as perhaps the biggest feather yet in New England’s cap. A day in the life of Western Michigan’s P.J. Fleck shows what is takes to excel at the game of recruiting – mounds of caffeine, deep connections and an unmatched enthusiasm for the sport. The youngest coach in the FBS has changed WMU from an afterthought school to one that is hot on the recruiting trail and a force on the field. Orchestrating the biggest turnaround in school history, Fleck knows that to capture a recruit he needs enthusiasm, sincerity and a routine that is anything but monotonous. Although it seems to be working so far, Fleck understands that every day is a new one and new tricks are required. …Year?! Savior?! Last we’ll ever hear of Billy Goats?! Whatever it is, it’s exciting. Welcome to Joe Maddon’s Chicago. Optimism as big as Maddon’s is rare for a team that has been so bad for so long, but Maddon – along with Vegas oddsmakers – has the Cubs going far this year. There are many questions swirling around them and as the season approaches, some fans believe this could be the year they win it all. Armed with a solid core of returning players and a slew of free-agent signings, the time of wishful thinking is past. To Maddon, this is the season of winning. Poised to challenge racing’s reigning old guard, 22-year-old Kyle Larson is already attracting new fans to NASCAR – at a time when the sport badly needs a boost. With four DNF’s in the past, Larson has come a long way from where he was. Despite winning Rookie of the Year Honors, he knows there is a ways to go. NASCAR is in the midst of a changing of the guard and as it stands, Larson is set to lead the new crop of youngsters as they look to shake up the Sprint Cup ranks in the years to come. Brash? Absolutely. Controversial? No doubt. Patrick Reed has been deemed the bad guy and has certainly paid for it. Putting aside past relationships, college controversies and a near-death experience involving his wife Justine, the 24-year-old golfer now looks to pair his maturation and internal drive to continue a winning resume that includes four Tour events – a feat accomplished by only an elite few. With the help of the fearless Justine, Reed battled for his Tour card the hard way and has already shown he has the game to back up his ambition. Kentucky is littered with NBA first-round talent, but the Wildcats aren’t focused on offense. Rather, coach John Calipari and the Cats have put together the best defensive team in the nation – possibly in history – en route to holding an undefeated record and a no.1 seed. As the Big Dance approaches Kentucky has mastered defensive schemes and formed a substitution method that sacrifices nothing while costing opponents everything. Their defense is oppressive, their energy is never ending, and as the season continues, we just might see history being made. Rick Nash had the Rangers playing for their first Stanley Cup in 20 years, but lost his puck touch when it mattered most. Now the proven scorer, who combines small-man skills with a big-man frame, is working to put the Rangers back in the Cup discussion. Nash went scoreless in three of New York’s four playoff series and scored only three times in 25 postseason games last season. He was booed by New York fans as it seemed he may have lost his ability to score. This year, thanks to improved fitness and health he is on pace for his first 50-goal season and possibly an MVP award. Like his hero, Nelson Mandela, Raptors GM Masai Ujiri leads by example, with perseverance, integrity and generosity. His approach has resulted in a team that has captured the Toronto fan base, as well as a brighter future for his fellow Africans. The Raptors have become the most beloved team in the staunchest of hockey towns and it’s not by accident; Ujiri commands respect and treats everyone in the organization with honesty. His players sing his praises as he has built chemistry like no other, while holding each player accountable for success. So far it’s working, as Ujiri’s team is playing before sellout crowds and is possibly a title contender. Does this issue of SI contain an apology to Brady, Belichick and the Patriots for dragging their names through the mud over the previous two weeks?